A key member of the Royals’ 2015 World Series championship team, Moustakas became a free agent after last season, then signed a one-year contract with the Royals in March that includes a mutual option for 2019. With the Royals last in the AL Central at 31-70, he could be dealt before Tuesday’s deadline for trades without waivers. Moustakas ended Wednesday’s game by striking out. 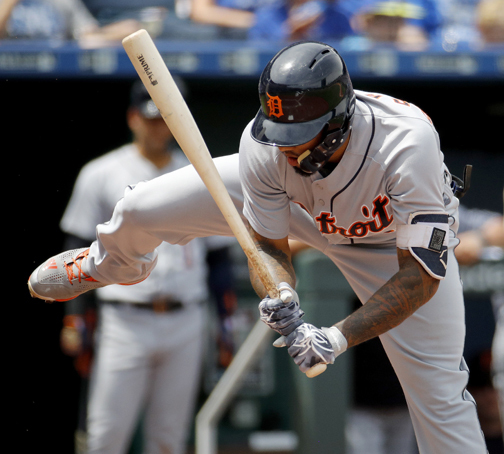 Jose Iglesias hit a three-run homer in a four-run fourth inning against Danny Duffy (6-9). Iglesias is 10 for 27 (.370) against Duffy in his big league career. Victor Martinez had three hits, including a pair of RBI singles. He was 6 for 12 with five RBIs in the series and had consecutive games with multiple RBIs for the first time since July 17-18 last year, also at Kansas City. Matthew Boyd (5-9) allowed two runs and seven hits in six innings, striking out seven and walking none. He had been 0-5 in seven starts since winning at Boston on June 7. “We won the series and that’s all that matters,” he said. Duffy (6-9) gave up seven runs, nine hits and two walks in 5 2/3 innings and threw wild pitches that allowed John Hicks to score the go-ahead run in a four-run fourth and Iglesias to come home in the sixth. The Tigers lead the majors with 51 days games. They are 25-26 in matinees. The Royals are 14-28 in the afternoon. Twins: RHP Michael Fulmer (oblique strain) is out indefinitely. Royals: OF Jorge Soler (broken left toe) remains on crutches and won’t be returning anytime soon after placed on the DL on June 16.